It is now slightly late to post the picture but I really liked this photograph and thought that it must be shared with you. The ministers of Pakistan Muslim League (PML) celebrating Diwali at the party headquarters in Islamabad. 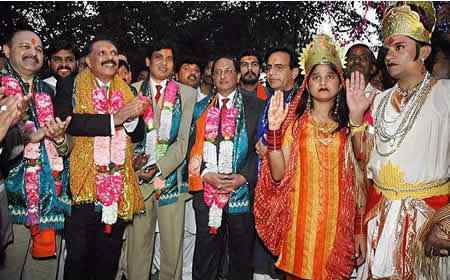 The person who is seen third from the left in the photo is Ejazul Haq, the son of former Pakistan president Ziaul Haq. 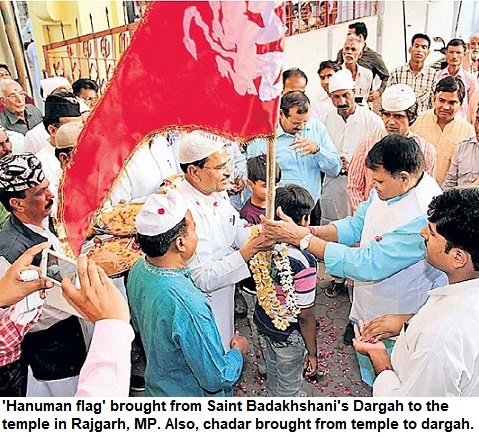 The PML leaders are seen with 'tilak' on foreheads and seeking 'ashirwad' blessings from a couple that is posing as Hindu gods. They have been garlanded and offered the customary sweets. We don't get to see such pictures about our neighbouring country in Indian media. Even if it is just a gesture, it is important. Religious minorities must get the feeling that they belong to the place. Their culture must be respected fully. When different communities come together to celebrate a particular festival, it shows a society in positive light. Just like 'iftaars' are organised in India during Ramzan, despite the politics, such gatherings and events sends a message to the minority and generates goodwill. It is easy to be cynical but believe me these gestures signify a lot and go a great way towards sending the right message to the minorities. When we see it happening in Pakistan, it has an even greater impact. Let's hope that such goodwill extends in all spheres. UPDATE 2013: For more photographs showing Diwali celebrations in Karachi go to this LINK.